As more people choose a plant-based lifestyle or simply cut down on animal products, non-dairy milk is becoming quite popular—and the dairy industry seems to be getting nervous about their falling sales. Need proof that non-dairy alternatives are taking over? The dairy industry’s latest advertising strategy is centered on criticizing their non-dairy competitors. Popular dairy brands have been running deceptive ads about the nutritional content of non-dairy milks. For example, I recently saw a commercial on TV that compared the number of ingredients in dairy milk and non-dairy milk. The commercial promoted dairy milk as the cleaner, healthier option simply because it only has one ingredient on the label—but there are so many delicious, healthy non-dairy milks out there without any antibiotics, hormones, or cruelty added. But this isn't a rant about dairy—there are already plenty of great resources explaining why dairy consumption is detrimental to our health. To learn more about the downsides of dairy, I recommend watching the documentary Forks Over Knives and reading this article by vegan doctor John McDougall. Instead, let's talk about all of the nutritious non-dairy milks on the market and how to choose the perfect plant-based substitutes for cooking, baking, and more. I have a video blog post, what is non-dairy milk?, but the topic is worth a little more exploration. When people ask me which non-dairy alternative they should purchase, my general answer is to simply find a plant-based milk you like and use it. Long gone are the days when there were only a couple brands of soy milk to choose from. Today, we have countless options, and you can find any flavor to suit your tastes. Try a few different types, and see which ones you enjoy the most. If you don't like soy milk, that's fine. Try almond, rice, or oat milk. Buy a couple different brands, and see if you prefer sweetened or unsweetened varieties. There are a few non-dairy milks I suggest avoiding. Coconut milk is very high in saturated fat, and it doesn’t always work well in cooking or baking. Baking with hemp milk can also be risky: the strong, earthy flavor can easily overpower the other flavors in your recipe. It’s true that some non-dairy milks can be pricier than cow’s milk, but if you want to reduce the cost, you can whip up your own with a blender and a strainer! You can make your own rice milk very easily. You can also make your own almond milk and oat milk easily, but soy milk generally needs a machine. Soy milk is one of the most popular non-dairy milks, and it is typically one of the cheapest non-dairy options in the supermarket. 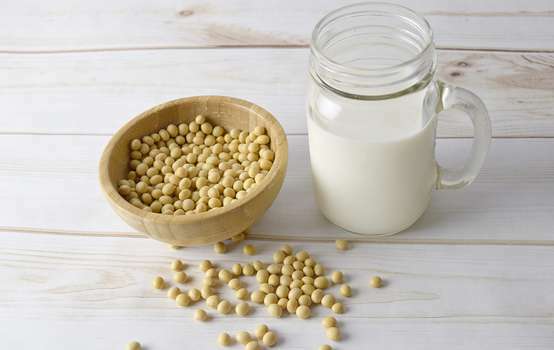 It is made with soybeans, and it has a mild flavor and a creamier texture than cow’s milk. In terms of nutrients, it’s a great swap for cow’s milk: it contains about 8 grams of protein per cup with only 4 grams of fat. Almond milk, which is made from ground almonds and water, is another popular non-dairy milk. You can find it in grocery stores and coffee shops everywhere. It is usually fortified with calcium, and you can typically get about half your daily calcium needs in just one cup. It is a low-calorie option with a thinner texture, so if you’re used to drinking skim milk, this could be a good substitute. Oat milk is slowly becoming a plant-based favorite. This smooth, creamy non-dairy milk is naturally sweet, making it a fantastic choice for tasty lattes. It contains more calories than some other non-dairy milks—one cup has about 130 calories—but it’s also high in fiber and healthy, whole carbohydrates. It’s a bit more expensive than soy milk or almond milk, but you can easily make it at home, which lowers the cost. This non-dairy milk is relatively new to grocery store shelves, but if you’re looking for a low-carb option with a little extra fat, it’s a good choice. Cashew milk is usually made by blending cashew butter and water. You can easily swap your dairy creamer for cashew milk—the sweet, nutty flavor is the perfect complement to a cup of coffee. You can also buy cashew and almond milk blends. Macadamia milk is another substitute which has become a go-to choice for baristas. It’s also popular amongst low-carb vegans. Try macadamia milk in your morning coffee or smoothie to add some extra healthy fats with only one gram of carbohydrates per cup. Pea milk is just hitting the market, and many vegans say that out of all the non-dairy milks, pea milk has the closest flavor to cow’s dairy. It’s made from pea protein, and it is fortified with vitamins and minerals. Right now, there are only a couple brands of pea milk for sale, but you can easily find it in major chains like Target. Quinoa is a hearty grain packed with protein, and quinoa milk is also a nutritious choice for a non-dairy alternative. It’s a complete protein, meaning it contains all nine essential amino acids, and it’s also full of fiber and important minerals like magnesium and zinc. You won’t find it in many stores yet, but it’s easy to make at home! Rice milk has always been a favorite for people who need an allergen-free, non-dairy milk. If you can’t consume nuts or legumes, you could try rice milk instead. However, be aware that it does contain inorganic arsenic, and consuming too much could pose a health risk. This is why rice milk is generally not recommended for growing children. 1. Make sure the plant-based milk you are using doesn't contain oil. Refrigerated milks usually do, but shelf-stable do not. Shelf-stable plant milks also tend to be cheaper, and you can buy them in bulk to ensure that you never run out in the middle of a recipe. 2. If you trying to eat a low-fat diet, you might want pick the brand with the lowest amount of fat per serving. This tends to be rice or oat milk, as soy and almonds both are fairly rich in fat naturally. You can, however, find low-fat and fat-free soy milks. We like WestSoy's non fat soy milk but tend to buy unsweetened almond milk. 3. Choose a plant milk with fewer ingredients—or make your own to avoid additives and preservatives. You can make almond, cashew, oat, rice, or quinoa milk in your kitchen. 4. In order to replace the nutrients you used to get from cow’s milk, check out the nutrition facts when you’re choosing a non-dairy alternative. Pick one fortified with calcium, vitamin D, and vitamin B12. 5. Buy unsweetened if you can. If you like sweetened varieties better, that’s fine—just be mindful of the sugar content. A little sweetener in your plain or vanilla non-dairy milk is nothing to worry about. However, chocolate flavored plant milks can contain a lot of sugar and artificial flavors, so I wouldn’t recommend drinking them on a daily basis—it’s like dessert in a glass! 6. Choose your non-dairy milk based on your needs. If you’re looking to replace your coffee creamer, try oat, soy, cashew, or macadamia milk. For cereal, soy or almond milk is a good alternative. If you want something that closely mimics the taste of cow’s milk, go for pea milk, and if you’re trying to incorporate more protein into your diet, go for quinoa milk. If you’re baking, check to see if the recipe calls for a specific substitute, and if not, try almond, cashew, or oat milk. As far as my personal preferences, I use unsweetened almond milk when cooking and baking, but I don’t drink it by the glass. When I used to eat cereal, I used sweetened, fat-free soy milk. When Scott was transitioning to a plant-based diet, he used to drink non-dairy milk by the glass, and his favorites were sweetened soy milk and sweetened almond milk. I find that many people in the transitioning phase enjoy sweetened almond milk, but you may find another variety that you like. Finally, about that commercial. I can make rice milk (and almond milk) with just rice or almonds and water. Sorry, dairy but non-dairy milks win on simplicity!